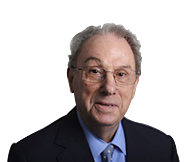 I’m Andrew Smithers; I studied economics at Cambridge and used to run the fund management business at S G Warburg which became Mercury Asset Management and is now BlackRock. The damage done to the UK and US economies by buybacks in preference to capital investment was a central theme of my book The Road to Recovery, and it has found its way, not too often I hope, into these blogs. I have therefore been heartened by the growing interest shown by the financial press in this threat to our economies. The Economist recently devoted a major section to the issue, as did the Financial Times on October 12. The change in the way managements are paid drives buybacks but this has yet to be widely appreciated. The US Federal Reserve’s quantitative easing programme was rightly underlined by my colleagues as adding the fuel of cheap debt but, without the preference for buybacks, low bond yields would have encouraged capital investment. This they markedly failed to do. An important paper, shortly to be published in the Review of Financial Studies, “Corporate Investment and Stock Market Listing: A Puzzle?” by John Asker, Joan Farre-Mensa and Alexander Ljungqvist demonstrates that a huge difference has appeared in recent years in the levels of investment by quoted and unquoted companies. It is clearly absurd to claim, as is nonetheless so often done, that companies are deterred from spending on new equipment by fears about future demand. If this were correct, it would be a concern restricted to quoted companies and to which unquoted ones are immune. Listing matters because unquoted companies are more often controlled by investors with a long-term interest in the company’s future. While this has always been true, the change in management remuneration has greatly magnified the difference in incentives and, thus, in the behaviour of the two groups. The difference, therefore, does not lie in fears about economic prospects but is determined by whether the companies are listed. Another misunderstanding was shown in a letter to the FT from Insead finance professor Theo Vermaelen, who criticised the October 12 article by Michael Mackenzie and Nicole Bullock on the grounds that it is a “widely documented fact that, on average, companies that buyback stock outperform their peers”. The key issue here has been misunderstood. 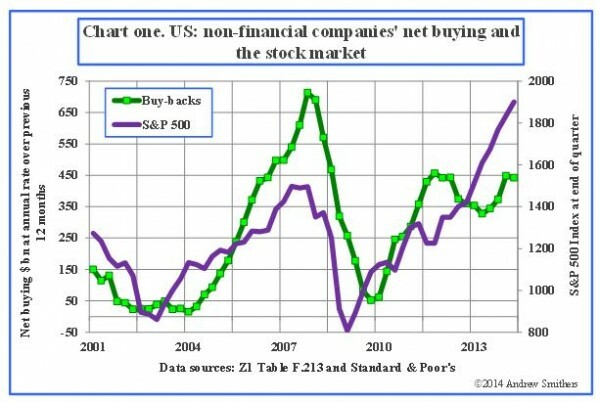 The concern is not that buybacks damage share prices. What we observe is that high buybacks and low investment have a common cause, which is the change in management remuneration. While this may or may not be in the interests of shareholders, the problem is that it severely damages the economy. Not everything that is good for shareholders is good for the economy. Weak competition is an outstanding example, to which the impact of modern management remuneration systems has important similarities. In many industries, companies have considerable short-term monopoly power. If they choose to push up prices, which increases the risk of being undercut by competitors, or keep investment levels low, which would allow competitors to have lower production costs through newer equipment, they increase the risk that their companies will lose market share. But, particularly in the case of investment, these risks are long-term rather than short. Furthermore, if the incentive to push up prices and underinvest is widespread, the short-term risks are reduced. The risk of losing market share is low if almost everyone in an industry is seeking to boost prices and keep down investment. A reduction in competition will boost profits and, looked at exclusively from the narrow view of shareholders, there is no call for governments to seek to prevent an increase in monopoly power. Indeed, if what is good for shareholders was automatically good for the economy, then economic policy would be devoted to reducing competition. But rent-gouging monopolies do great damage to the economy, which is why we need to be alert to the risks of falling competition and have an active policy to prevent the rise of oligopolies. For the same reason, we need policies to counter the damage that is being done by the change in management remuneration. There are many ways that this can be done but, before the necessary policies can be introduced, it is essential that the problem is recognised and widely debated. The increase in concern, illustrated by the articles in the FT and The Economist, is therefore to be welcomed. But the level of misunderstanding and distraction is high and comes in various guises. The idea, discussed earlier, that the issue is whether or not shareholders benefit is one misconception. The perceived unfairness of the huge increase in management pay is another distraction. I sympathise with such concerns but there is ample evidence that shareholders have received no benefit from the rise in pay. There is therefore a strong case against the rise in management remuneration, even from the narrow view of shareholders’ interests. But fairness is a very subjective matter and I fear that, if the discussion of management pay is limited to whether it is fair or in the interests of shareholders, it will result in unfocused debate rather than effective action. I am anxious therefore that the economic damage should be the subject that receives most attention. While we seem a long way from the widespread understanding of these dangers, a paper published in the Harvard Business Review’s September 2014 edition, “Profits Without Prosperity by William Lazonick, does an excellent job of pointing them out. The paper rightly scorns the excuses that corporate executives give for buybacks. Prof Lazonick correctly identifies the true motivation for buybacks, which is that stock-based instruments make up the majority of senior executives’ pay. In addition to their economic importance, buybacks are very important for equity prices. As companies are the main, and often the only significant, buyers of shares, the stock market is likely to suffer if companies are deterred from buybacks by the negative publicity that they are receiving. Experience, however, points to the direction of change in share prices as being a more likely deterrent to buybacks than adverse publicity (see chart one above). This shows that buybacks rise and fall with the level of the stock market and it is surely difficult to praise buybacks as being good for shareholders when they are made at such disadvantageous times. Buying overpriced shares is a way of destroying value and spending more money when the market is most overpriced is particularly egregious. When the market falls, share buybacks destroy less value for shareholders but they also become less valuable for managements, whose bonuses are linked to share prices. They become more valuable, however, for those whose bonuses are linked to returns on equity or earnings per share because the cheaper the shares are, the more these metrics can be improved by the same dollar expenditure. If profits start to fall, buybacks cease to be of much help to management as they cannot offset the negative impact on ROE or EPS. Provided profits hold up, I think it is more likely that buybacks will continue to support the stock market. Many of the incentives for managements will remain in place and, if profits do not fall, the key issue will be the financial ability of companies to buy shares, which depends on their cash flow and balance sheets. 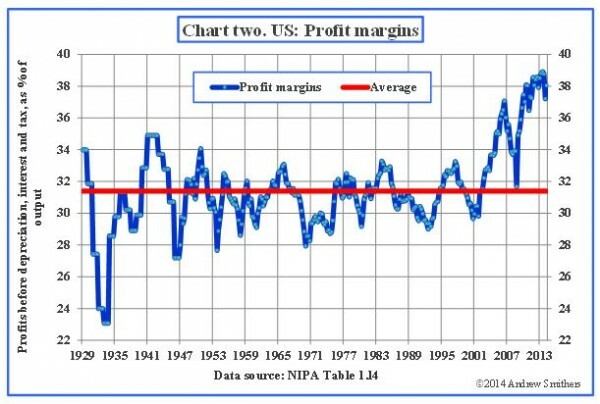 The extremely high level of profit margins (see chart two below) means that cash flow is abundant for financing buyback. In addition, companies claim and presumably believe that they have low leverage, so, if cash flow alone is not enough, increasing debt should pose no problem. Mr Mackenzie and Ms Bullock quoted an alternative view in their article from an investment banker who remarked that “ buybacks will continue until companies regain pricing power”. Now, in the universe in which I live, pricing power is revealed in profit margins. As chart two shows these are at their highest recorded level in the US. There would appear therefore to be no lost pricing power to be regained. However, readers of this blog will know that investment bankers and I appear to inhabit parallel universes.